The amount of new technology springing up around us can be dizzying, especially when our students are picking it up so quickly. Much of their daily life is conducted online – so how can our classrooms extend into that area of their life? Videos in class are tried-and-true, but sometimes might feel like a cop-out. In this video, Josh Cabat gives us several ways in which to use video effectively as a teaching tool with many active applications to try right away! Why should you even consider using new technologies? “It’s collaborative, and it’s available 24 hours a day,” says teacher Robert Barker. Students can connect in their own time to their classwork and each other – strengthening their connection to the material. Finally – you don’t even have to use the technology during class-time. Assigning online homework in a “flipped” classroom, according to Greta Brasgalla, gives you more time and more material to discuss in class. You can hear more from Robert and Greta from their recorded “What’s Done is Done Online” webinar from last spring. 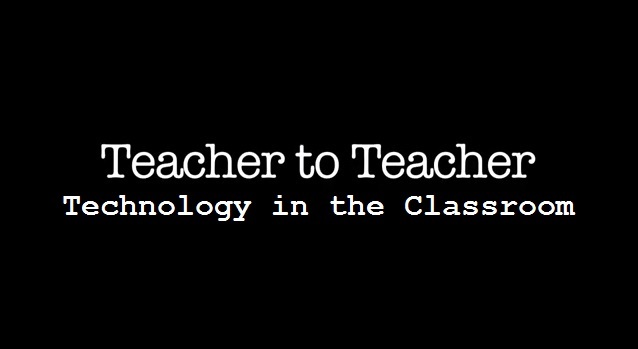 What technologies are you trying in your classroom? How are your students responding to it? Let us know in the comments! 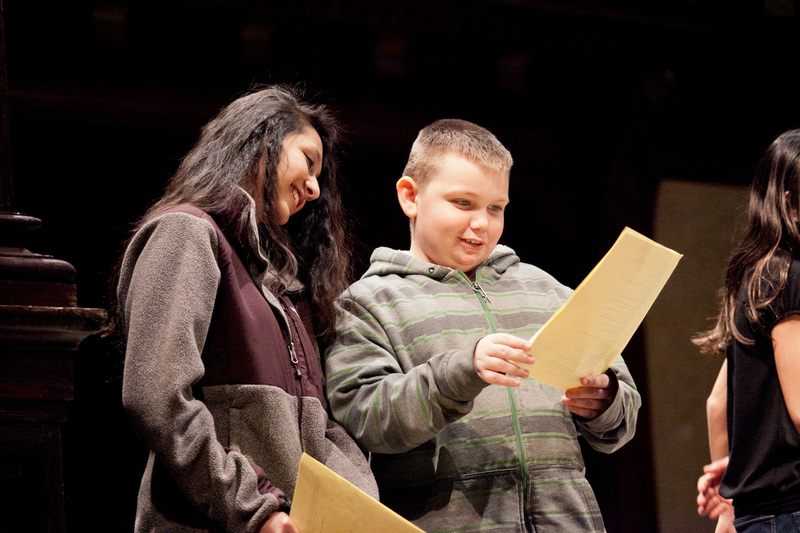 Students giggle together during a theatre game at the 2013 Folger Secondary School Festival. On the grass behind the theater – once a fire station – two teenagers embraced each other and slow-danced. They wore sheepish grins as they took each other’s hands, swaying and revolving to the music. Iron & Wine and Graffiti6 and Elliot Smith floated from my portable speakers. Curious dog walkers with waddling pugs and sweaty joggers threw sidelong glances. It was week four, opening day, only hours before curtain. Our Romeo and our Juliet were nervous. Would their performance be believable? The three of us met behind the theater to explore the act of falling in love. The two teenagers began by locking eyes, standing quiet for twenty minutes without once letting their glances dart sideways. Most students would feel too awkward to dance along the streets of Charlestown. But these two seventeen-year-old actors were willing to try. Saying yes is the number one rule of improv. If your improv partner says: “That soup you’re eating looks delicious!” and you respond, “I’m not eating soup,” the skit falls flat. In our converted black box theater saying yes became the first rule and promise of our ensemble. Last summer, as a teaching artist for Actors Shakespeare Project, my July crackled with witches and Scottish thanes. This year we – ten students and four teachers – took up residence in the bloody streets of Verona. Our students were a demographic chart of the Boston area. Our ensemble came from the suburbs and from the heart of the city; from public schools, from exams schools and from private schools. Some had previously lived in youth detention centers. Some had years of acting experience in camps and school plays and some came with no formal theatrical training. What set them apart from their peers was that these ten teenagers were willing, even eager, to say yes. Saying yes can be challenging in any setting, particularly in the confines of a traditional school classroom. Raising your hand, offering up the answer to a math problem, sharing a poem, proposing a hypothesis – they all open you to vulnerability. I have had 6th graders and college students of mine say no. I have had students as far as Thailand and Cambodia and as close as Charlestown say no. School textbooks and tests are lined with “right” and “wrong” answers and school halls are varnished in peer pressure and the shine of social status. The black box exists outside this norm. Over the course of four weeks I watched as ten teenagers chose instead to just say yes. They said yes to playing improv games that required them to squirm like jello and row furiously like Viking warriors. They said yes to walking and running and crawling through our theater to explore the space. Two young men said yes to locking hands and attempting to push each other across a room while yelling their lines and furrowing their brows. One young woman said yes to chortling like an old man with a beer belly and then cooing like a baby girl. Everyone said yes to playing games of Mafia every day (four weeks straight) during lunch, holding heated debates and flinging accusations, in each subsequent game, about who might be suspect. One young man said yes to swinging his arms in the air for an entire monologue. Another young woman said yes to trying not to smile (a real feat for her). In four weeks our students said yes to dancing in the rain, to singing, to arguing about character backstories, to fake punching each other in the nose, to sharing painful stories, to laughing out loud and crying out loud. It is not easy saying yes. You need three things. You need peers that won’t snicker, you need teachers who won’t seek “correct” answers, and you need a space wide open to allow students to spin and floors strong enough to encourage students to leap. And if you are lucky enough for such a convergence, then Romeo and Juliet waltz in a park, while dog walkers stare and at least one teacher smiles. What can you and your students say YES to? Let us know in the comments! 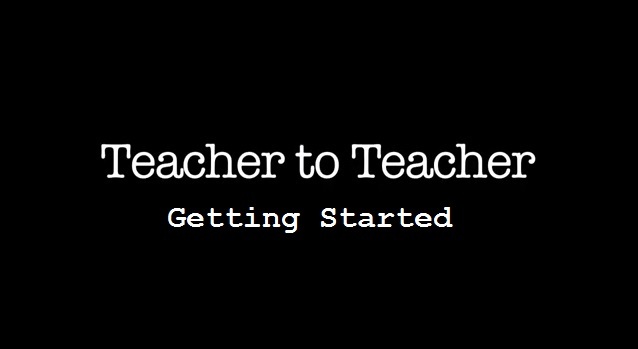 For the next few weeks, we’ll be running a feature on one of our favorite online resources: our Teacher to Teacher videos! In these short clips, teachers share their favorite Shakespeare plays, ideas for teaching, and resources for the modern classroom. 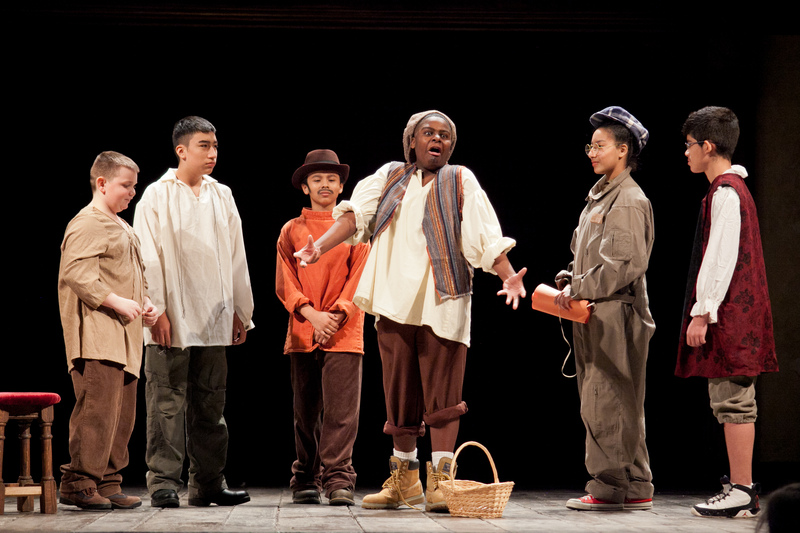 This week, let’s start generally with ideas for introducing your students to Shakespeare. First things first: we know that the language can be a big hurdle for many students on Day 1. In this video, Joe Scotese describes how getting students on their feet to find the action in the words builds their confidence for the days to come. You can teach Joe’s own Tempest in the Lunchroom to try it out! But where to begin? Leslie Kelly tells us that we don’t have to start with the opening lines of the play – instead, why not start with the characters’ deaths? Having fun with an overly-dramatic death scene will give them more ownership over performing the language, and give them a sense of play. Teach Leslie’s ESL/ELL-friendly Famous Death Lines. Finally, are you stuck teaching only one play? Scott O’Neil gives his arguments for incorporating speeches from all over the canon into any unit. Not only will learning the speeches familiarize students with the language, they might never be exposed to certain plays, otherwise! Scott’s already compiled his favorite speeches from King Lear for his class. What speeches would you use? What’s your favorite way to introduce Shakespeare? Tell us about your Day 1 experiences in the classroom in the comments below! Opening weekend has come and gone for Julian Fellowes’s new version of Romeo and Juliet in cinemas, and the numbers were not good. “When people say we should have filmed the original, I don’t attack them for that point of view, but to see the original in its absolutely unchanged form, you require a kind of Shakespearian scholarship and you need to understand the language and analyse it and so on. My mind ground to a halt reading that. I went quite speechless (except for the occasional squeak or screech or indignant huff.) Is he serious? The NY Times tried to give him the benefit of the doubt, preceding this quote thusly: “With tongue presumably in cheek or perhaps just a foot deep in mouth,” but still I reel at this presumption. How grossly can you underestimate your audience? A richly furnished Cambridge education is not what’s needed to revel in understanding of Shakespeare’s verses. It’s exposure to the language itself: put into action, spoken aloud, seen in performance, played with. And yet – I still wouldn’t have so much ire towards this if Fellowes had simply owned his adaptation and felt sufficiently comfortable to put his name in front of the title instead of Shakespeare’s. Sure, Shakespeare’s name sells, but don’t the names Romeo and Juliet have a little selling-power of their own? Why rely on the writer you’ve cut from the project? Shakespeare was an adapter, as I’ve mentioned before. So why hide behind him if you’re only going to push him out of the way because you think people are too stupid to understand his words? What do you think? Were any of you one of the few who saw this film over its opening weekend? Do you plan to see it before it closes? Ay, there’s the point… over there. Yesterday I stumbled upon this video from Australia’s ABC in 2011 about Shakespeare and his hip relevance to today’s audience. Excited, I started the video, and felt my face twist into a confused squint. A lot of their statements are great! Shakespeare was a great writer. His plays have survived for centuries. His language can be difficult because it’s very stylized, and once you “click in” it rolls more easily. However, they sort of veer off the point when they’re talking about these things for a modern audience. The stories are a part of what keeps Shakespeare alive, but the stories were all (or mostly) taken from other sources. Shakespeare’s language has survived, as well. It’s not just because we can make Romeo “emo” that we relate to the characters today, it’s because they are saying things that we think and feel as well. The Complete Works of William Shakespeare [abridged] is a really fantastic show, but it – on its own – is not “Shakespeare.” I do love that show, and it adds an element of fun that students would respond to – but it’s not the only way to make Shakespeare fun! What do you think? Why do you think Shakespeare is relevant, and how do your students find connections to his plays? Every year the schools participating in our local outreach programs, Shakespeare Steps Out and Shakespeare for a New Generation, have to select one of Shakespeare’s plays to perform at their respective Festivals. There are always the big populars: Midsummer, Macbeth, Romeo and Juliet – but sometimes the teachers are looking for something a little different, or something they can tie into other parts of their lessons throughout the year. There, at this party, is where Romeo first sees Juliet. (6. O, she doth teach the torches to burn bright!) They dance. They kiss. She says, (7. You kiss by the book.) Only at the end of the party do they learn that the other is from their own family’s hated enemy. It’s too late, they are in love with each other. Romeo sneaks away from his friends, climbs the wall into the Capulet’s orchard, and sees Juliet at her window (8. But soft, what light through yonder window breaks?) Juliet, not knowing Romeo is nearby, says (9. O Romeo, Romeo, wherefore art thou Romeo?) They confess their love to each other, but Juliet is called inside. Romeo says, (10. Wilt thou leave me so unsatisfied?) Juliet says, (11. If that thy bent of love be honorable, Thy purpose marriage, send me word tomorrow.) They enlist the help of Juliet’s Nurse to send messages and Friar Lawrence to marry them. When I select a play, I try to use one that has as much of these elements [outrageous humor, black magic, blood and lots of great sword fights] as possible. I also consider, of course, the number of students with which I have to work. Midsummer is great for a large cast. Macbeth is wonderful; the ghosts, madness, blood and sword fights make it fun to perform. I have recently added Twelfth Night to my selection…the idea of boys being girls and girls being boys gives everyone a great laugh and a real sense of Shakespeare. Ms. Rosenblatt also offers up three insights from working on Shakespeare with her students over the years. 1) The plays are very confusing at first, but the more you work with them the more they understand. The more they understand the better the performance becomes. 2) Encourage everyone to take a part- the bigger, the better. It never fails that those reluctant students who selected very minor roles always regret their decision. 3) Don’t panic or become discouraged. These kids will knock you out; just give them this opportunity and step back!! What are your favorite plays to focus on in class? Would your choices be different if you were (or weren’t) planning to perform them?